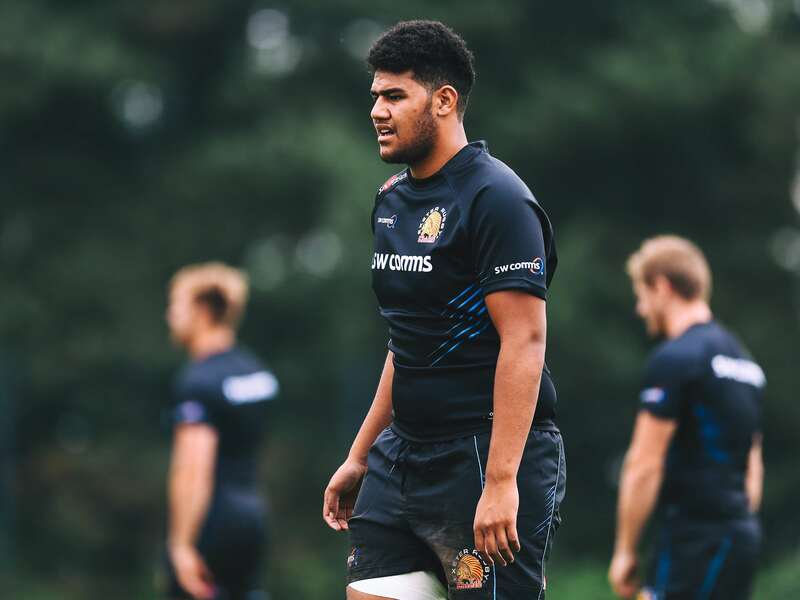 Highly-rated Exeter Chiefs youngster Rus Tuima says he's relishing tackling senior rugby for the first time this season. A leading figure in the club's Under-18s side last season, the Fijian-born forward was one of 14 players promoted from the academy ranks into Rob Baxter's first team squad this summer. It will mark Tuima's first taste of life another rung up the rugby ladder, but it seems the powerful 18-year-old can't wait to get started. "I'm very excited about the new season," said Tuima, who is the nephew of Fijian international Akapusi Qera. "Just being in and around the first team here at the Chiefs is a huge honour for me. Over the years I've watched the first team on TV and in live matches, but now being here and part of it, training alongside them, it's a great feeling." At a club where age is no barrier it seems in progressing forward, Tuima admits he is keen to follow in the stud marks of players such as Dave Ewers who, like himself, moved to English shores at an early age, but who quickly forged an affinity with the game. Ewers is one of a number of current Chiefs who have advanced from academy status to that of first team regular in recent times. And for players such as Tuima, it's a clear signal that with hard work, dedication and the right skill-set, reaching top-flight rugby is no passing dream. "Coming in from playing college rugby to pre-season training here, already I can see a big difference," added Tuima. "The speed of things, the physicality, plus the way that the players look after themselves, it's a bit of an eye-opener for us young players coming in. "Pre-season has been tough, probably one of the hardest things I've done in my life, but you have to push yourself to see the benefits. I know I've got plenty to work on with the coaches, but hopefully I'll kick on and reap the rewards of it all through the course of the season." Like others before him, Tuima is to be sent out this season on dual-registered terms to National League One side Plymouth Albion to help in his future development. "We've got the pre-season games coming up, then I'm going down to Plymouth, so it's a good opportunity for me to show what I can do." Brought up in Plymouth alongside sister Lagi, who last season represented England in the Women's Six Nations Championship, Tuima is a product of the Devonport Services RFC Youth section. He previously attended Ivybridge Community College, before moving on to Exeter College where he was further schooled under the watchful eye of new Chiefs Academy manager Rob Gibson and coaches Sam Morton and Ruiari Cushion. "All the academy coaches have really helped me," he continued. "They've not just developed me in terms of my fitness and conditioning, but also my skills and to be a good bloke all round. "It's not just with me that they've done this, it's with all of us in the academy. You can see over the years the success they've had with bringing players through and I'm hoping that I can do that over the next few years."